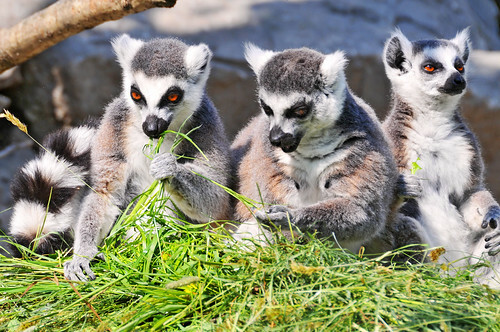 12 things you didn’t know about lemurs. 2. They are classed as prosimian primates - considered to be less evolved than monkeys or apes. 3. There are still species of lemurs being discovered and described by scientists. 4. They are unique to Madagascar. 5. The name indri was given to the largest lemur by the naturalists who were first shown a group by some locals who called "Indri! Indri!" when then spotted them, which means "There! There!" in Malagasy. The naturalists thought that this was actually the name of the animal. 6. The mouse lemurs are the smallest lemur and the pygmy mouse lemur is the smallest weighing just 30g. 7. The sifaka move along the ground doing a bounding dance rather than going along on all fours like other lemurs. 8. The aye-aye is probably the most unusual lemur in that it has an elongated middle digit on its left hand for collecting grubs from trees. 9. Lemurs are found in a range of different habitats, from tropical rainforest to drier forests in the south of the country. 10. The main predators of lemurs are snakes and the fossa. 11. The Mittermeiers sportive lemur is currently known to only live in Ampasinder Peninsula. 12. The lesser iron-grey dwarf lemur has been described from museum specimens and there are no known locations in Madagascar for it.